New developments market the promise of sustainability, walkability and amenity. Too often, what eventuates falls well short of that promise. Chippendale’s Central Park development promised a balanced mix of commercial and residential development with best practice environmental outcomes. Apart from some iconic green buildings, the main commercial proposal evaporated, replaced by student housing, increased density and some very ordinary buildings through incessant project modifications. As a symbol of the failure, artificial turf is needed to accommodate the resulting density and recycled water still does not feed the iconic green buildings. The developer is not solely responsible for liveability and amenity. The state government, that encourages and approves such developments, has a responsibility to ensure that the infrastructure necessary to support the promise is put in place by the developer. It also needs to ensure the increased population has the publicly supplied infrastructure it needs. Walkability is not possible for primary school children if their school or recreational space is not within easy walking distance or if it requires them to negotiate a number of main roads. Blackfriars Public School in Chippendale was one of the inner city schools closed due to declining numbers that is now needed to accommodate new developments like Central Park. 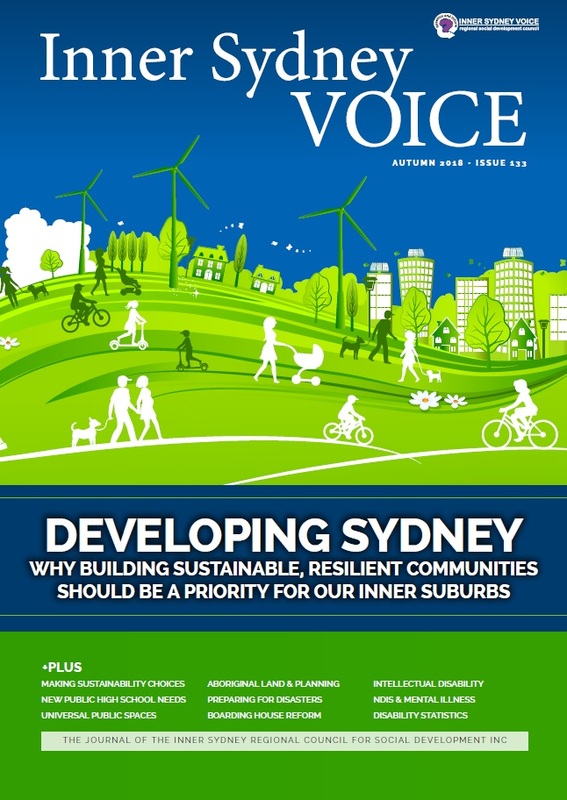 In this issue of ISV we are looking at some things needed for the promise of liveable inner city precincts to be delivered. We look at the comprehensive public high school black hole in New public high school needed in eastern suburbs. From the Vault – School closures takes us back to 1980 when the decision was made to close these high schools. We explore how to make the public domain truly accessible in Out and about with universal design. A look at Disability by the numbers tells us how important accessibility is for people with a disability as well as children and older people. Sustainability is a complex interactive issue taking in traffic, waste, water, nature, energy and food production. We explore different levels of sustainability and possible trade-offs in Sustainability: Exploring development options. The planning system is one of the reasons Aboriginal land rights has not delivered the economic benefits that many expected. Rethinking Aboriginal land and infrastructure explores that issue. London’s Grenfell Tower fire focused attention on what happens when a disaster strikes a high-rise public housing building. In Redfern – Surry Hills Community Resilience Committee blossoms we find out about a project exploring these issues in Sydney. We also explore how prepared you might be in Disaster resilience: How does it impact you?. Continuing our NDIS coverage are The National Disability Insurance Scheme (NDIS) and mental illness as well as People with intellectual disability and mental illness: A forgotten minority. Five years after the NSW Boarding House Act it’s time for Evaluating boarding house reform. In community notices: ISV has a redesigned website with new resources; and we are looking for input on People focused human services – What needs to be fixed? This is especially for public housing tenants so that we can feed into various human service discussions currently underway.